The Brunswick Magnitude 035 bowling ball pairs the Relativity Flip Solid coverstock with the Magnitude Low Diff symmetrical core to create a ball that provides both power and control. This is a go to ball for both league and tournament bowlers due to the control it offers on the front end and the reaction it offers on the backend. This ball was designed for medium to oily lanes where it is able to provide easy length and mid lane control as well as exceptional pin carry. Lane Side Reviews take the newest from Brunswick Bowling to the lanes as they check out the #Magnitude035! I'm thinking about buying this ball, but I have some reservations. This ball is being marketed for being long ,smooth and a controlled back end. Couple of my concerns is will the ball die before hitting the pin deck and will it hook on typical house. My shot right now with a purple hammer i'm standing around the 30 board and my mark is 7 or 8 board for right to left. 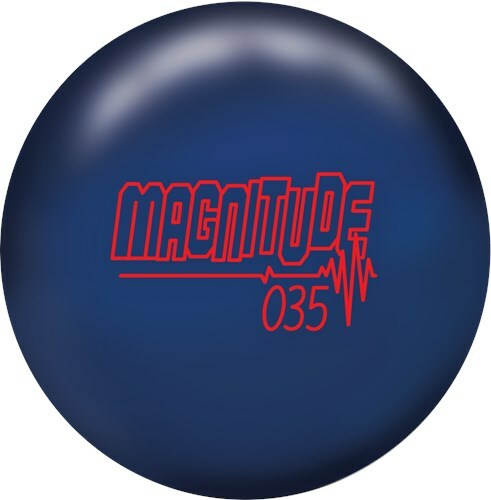 I drilled the Magnitude 035 to be my "go to" ball for lane conditions that are less than ideal, especially sport or challenge patterns where your miss room is negated to a degree, and you need a ball that will help give you extra boards to play with. The Magnitude 035 does just that. With the pin down layout, I am able to control the back end exceptionally well, as the ball picks up the middle part of the lane and rolls very smooth and continuous through the pins. On a THS, it is not the first ball out of my bag, rather when the lanes break down it is there to help with transition when other balls become over/under and sensitive to the the wet/dry conditions. On sport shots, this ball shines. I have used it on WTBA Paris, WTBA Athens, and the 2011 USBC Masters pattern, all with tremendous results when compared to other balls on the same pattern. I find that the Magnitude gives me 1-1.5 extra boards of miss room inside AND outside of my target, which certainly comes into play anytime you bowl on challenging lane conditions. If you are a tournament bowler, you HAVE to have this ball in your bag at all times. You are literally throwing pins away if you don't. Plus, even if you're a one day a week bowler, you can use the Magnitude 035 to blend out league conditions which can vary week in and week out. This ball is available now from your local pro shop, get yours today! Magnitude 035 is a well balanced ball that can benefit bowlers with any drill pattern. The ball does not over hook in the dry, even with an early roll drill. On the fresh, the ball still has enough power to have a nice arc to the pocket, with box surface. Played on the THS, 2nd arrow with a little bump outside, and the ball stays low to the deck with exceptional carry of the corner pins. On a drier sport pattern, the ball can be played across the lane with a break point further down the lane, and it will recover nicely, and still have the power to drive through the pins. This ball is another example of Brunswick offering balance and control in their equipment, solid and pearl. My suggestion would be to keep the box surface for the best possible reaction on the lanes. The Magnitude 035 is the ball I have been waiting on for quite some time. It has a lower differential weight block that allows it to clear the heads and retain energy combined with a cover that will read the pattern well. This ball makes the average house shot look quite easy. It allows me to move right and take advantage of the hold provided by the volume in the middle of the pattern. I can finally play the lanes the way the guys with all the speed and the tilt do without having to pile on the ball speed. This ball creates extra room all over the lane. If you have enough friction and you have a semi consistent release it is quite hard to miss the pocket with this ball. I also noticed extra room right with the Magnitude 035. In situations where other balls would just burn up and stop this ball would keep coming. I felt like I had gone back in time 15 years as far as lane transition was concerned. The Magnitude 035 allowed me to make minimal adjustments while making both lanes on the pair seem almost identical. I almost never see the lane this way in the current environment. The forgiving qualities of this ball are going to come into play very often. It should get quite a bit of use on the tougher patterns for this very reason. The Magnitude 035 should be a great choice for tournament player and league bowlers alike. Consistent versatility that makes the lane look easy that is the Magnitude 035. When deciding on what I was looking for in the Magnitude I was thinking benchmark. I guessed right, as this ball is so versatile, it can almost always be the first one out of the bag. The house pattern I bowl league on is a little longer this year (44 ft) with a good deal of shim. I went with a pin down in the middle of the grip line with a medium hold 1 inch down on the VAL. The cover on the Magnitude handles the length of the pattern and core controls the breakpoint nicely with the side to side ratio. Even if I get the ball right a little too quick the ball doesn’t over react and if I get there a little late, it still is strong enough to make the corner. I also really like the predictability of the Magnitude on the medium length sport patterns. There are so many good things to be said about this ball. A low differential release from Brunswick coupled with a fairly aggressive coverstock makes for a terrific benchmark ball for tough fresh and sport patterns and for me, helps to reduce over/under reaction on house shots. Mine is drilled 60 X 3 3/4 X 45 and rolls so predictably and powerfully that I can't wait to test it out on every pattern I come across. It's also very responsive to surface changes when needed. A real winner from Brunswick. He is a new serie in the Brunswick brand, the Magnitude serie. The first one is the Magnitude 035. The number comes from the differential of the core which is 0.035. The core is wrapped up with the Relativity Flip Solid coverstock. This ball is designed for medium to oily lane condition. Because of the low differential of the ball, this ball is designed for tournament players and rev dominant player. Because I wanted to have a really smooth and controllable ball to play on harder or shorter patern, I drilled this ball really strong. I’ve put a 50x 3 3/8”x40 layout. The ball rolls exactly like I anticipated. The ball starts to roll really soon and make a really predictable an controllable turn to the pocket. Compared to the DV8 Pitbull Growl, I play the 035 three boards right with my feet and two with my eyes. Compared to the Inferno Blue Flame, I play the ball in the same area but the difference is in the shape. The 035 rolls sooner and is more controllable on the back end. Compared to the Inferno, I play the 035 two boards right with my feet and one board right with my eyes. For people with more speed or wanting to play on heavier patern, the ball can be sanded to 1000 or even 500 grit and the ball will still rolls strong and it the pocket. For people with less speed or wanting to play on lighter patern, the ball can be polished to avoid it to roll too soon in the heads and burning up. To conclude, if you are a rev dominant or a tournament bowler, the 035 is for you. Drilled my Magnitude 035 40x4x50 (pin in ring) hoping for a step up from my Fanatic BTU as a Brunswick equivalent of what many bowlers are seeing from their IQ Tours. The shape from this ball is totally unique to the Brunswick line as it doesn't rev up hard or turn sideways, yet it still has a cover that likes some oil. It has taken me a little while to figure out where this ball belongs in my bag, particularly because we haven't seen much other than house patterns all summer where more length and backend were ideal. Fast forward to the league season where we have been bowling on 40' Abbey Road in our challenge league which has been tricky as it plays flatter with crisp backends. The Magnitude has been an absolute godsend allowing me to see a controllable backend motion from the track, while still giving me a little bit of recovery right. As the evenings have worn on, I have been in able to chase the head oil left and still maintain sufficient backend reaction to carry the corners. Compared to other balls in my bag, the Magnitude typically has my feet 5-6 boards left of where they would be with my Fanatic BTU. In terms of boards covered it is on par with most of my midrange equipment, but its more controlled shape has it give me more forgiveness staying straighter on fresh oil, while most of my midrange balls are better once I want to open my angles up after a few games. I recommend the Magnitude 035 for anybody looking for an option to help them keep their angles straighter on trickier patterns - particularly those under 40'. This ball will provide a completely different shape than anything in the current Brunswick line and will be a favorite of rev dominant players on fresh oil. I don't know why it took me this long to post about this ball, but it did. Probably because I was having too much fun playing with it! I have my Mag .035 drilled, pin over the bridge with the cg stacked below it. The ball has about a 3" pin. It is a 15lber, and I usually roll it around 14mph, comfortably. I can get it to 15mph but 14 is my average speed. I am rev dominant. I was first alerted to try this ball by Tim Foy who is a Brunswick staffer. He told me I would love this ball and I could not go wrong. That was a pretty spot-on recommendation from him considering he has never seen me bowl!! LOL! I love this ball! It never leaves my bag, and it has replaced an older AMF piece that I formerly used as a benchmark ball. The thing I really like about this ball is its great carry. I can really hook it if I want, but it is superbly qualified to "do its thing" when I tighten up and play my straight game! this has been excellent for me in tournament play when I wanted to play just inside of the tracks of some heavy hitters! The coverstock is very versatile. It can manage a surprising amount of oil. This is not a ball I would swing the entire lane with, but definitely one I can hook in front of me. I especially love the consistent, not jumpy, move on the backend! That is the thing that lends itself to reliable carry! I am not a staffer, just a house hack! This is a great all around ball that everyone should have in their bag! Brunswick hit a homer with this addition! Page created in 0.694 seconds with 24 queries.